On Sunday, July 22, I was truly able to act up the Rotary ideal of “Service Above Self.” On that day, I was blessed to lay the cornerstone of the new teacher’s quarters at St. Kizito Namusera Primary School in the Wakiso district of Kampala, Uganda. A pretty big step for a Rotarian from Higginsville, MO Rotary Club in District 6040. Leading up to that moment were many events in the life of new Rotarian. I am an educator by profession. Mike Warneke has been a family friend for 18 years, but in the past six years he has grown an international non-profit organization - Fields of Dreams Uganda - whose mission is to provide hope to the orphaned and vulnerable children of Uganda through the vehicles of soccer and education. Through this organization I was able to travel to Uganda this July with Mike and 10 other individuals. I asked Mike how Rotary could help the children of Uganda and he suggested the building of a teacher’s quarters at a primary school. Education in Uganda is vastly different than in the United States. It is typical for primary school class sizes to exceed 50 students. Teachers in Uganda make the equivalent of $120 a month and if they don’t live on campus, they can spend 60% of that on transportation costs. Additionally, at St. Kizito, no teachers lived on campus and they dealt with additional issues of stolen latrine doors (corrugated tin) and light bulbs. The Higginsville, Missouri Rotary club, of which I am a proud member, issued me a $5000 challenge grant to confront this challenge. 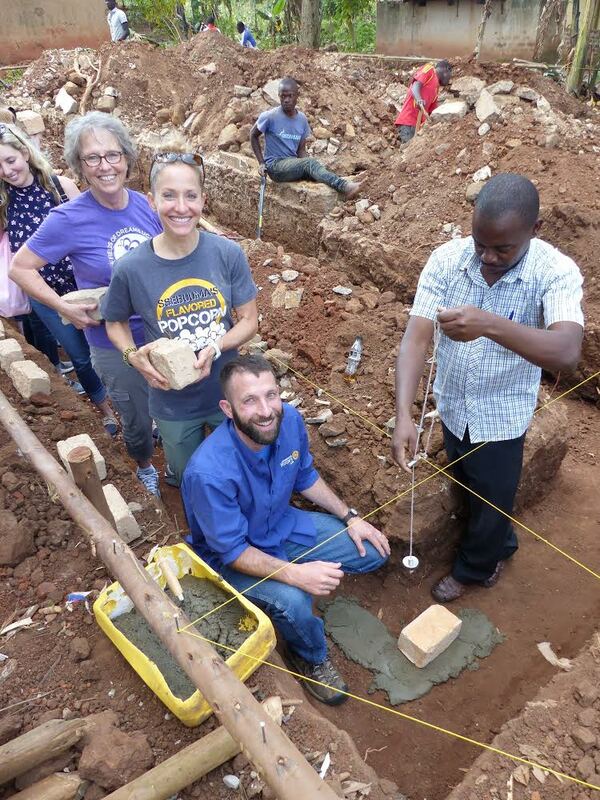 That was met with $5000 of donations from local individuals and what resulted was a $10,000 donation to provide the capital necessary to construct a four-unit masonry building using local Ugandan materials and contractors. Each unit will have a bedroom, a living space, and a small cooking/storage area. The staff of St. Kizito and Fields of Dreams Uganda honored me by letting me lay the cornerstone. Once that was done, the true work ethic of the Ugandan people was in full display. Because of overwhelming community support, the project is currently ahead of schedule with dedication tentatively set for September 25th. While in Uganda, I was able to connect with and meet members of the Wakiso Rotary Club and Gulu Rotary Club, both of Uganda. I was honored to give them both a club banner, but since their meetings were the same night and time, I was only able to attend the Gulu meeting. There I had one of the most pleasant surprises of my trip. I was able to meet John Mary, possibly the only Royals fan in Uganda, and a recent graduate of Rockhurst University. This trip was one of the most meaningful events of my life and I was so happy that I could share my Rotary connection with new friends in Uganda.